My family members all have gardens, I have a garden and I’m a member of a farm share. Needless to say during summer and fall, my house is practically covered in vegetables. It’s sometimes challenging to find time to freeze and cook everything, but it’s also fun being creative and planning menus. I should probably learn how to can, jar or pickle some vegetables at some point. If anyone has any good online resources to recommend, I’m all ears. Anyway, this recipe was a big hit. It’s very light, yet nutritious and indulgent and best of all it’s low-fat and packed with vitamins. It’s 100% gluten-free. I imagine this recipe could also work as a raw vegan alternative. If you’re vegan you could entirely omit the cheese from the dish as well. My husband got a little nervous when I told him I’d be making a pasta dish without the pasta, so he cooked a small side of pasta to go with his veggies. Add sage, parsley, garlic, and lemon juice to your food processor and chop until it reaches a smooth consistency. Mix in about 1/8 – 1/4 cup of olive oil, parmesan and goat cheese. (Pour in 1/8 and if it’s a nice consistency, you can stop there or if it’s too dry and a little more olive oil). Slice mushrooms and sauté them in olive oil (abt. 2 TBSP) over a medium heat for about 5 minutes, stirring frequently. With a julienne peeler shred your zucchini into strips. Once mushrooms are slightly softer, add your zucchini “spaghetti” and cherry tomatoes to the pan with the mushroom, add another tablespoon or two of olive oil, mix ingredients together. Cook for about 5 – 7 minutes over a medium heat. Turn heat to low and stir in your sage pesto. Season with sea salt, pepper and crushed red pepper. I used to always purchase commercial brand cereals for breakfast. It was simple, quick and convenient. However, the more I cook, the more conscious I am about the ingredients in my food. Now, I never buy boxed cereal and try to diversify my morning plate with some delicious and healthy breakfast alternatives. It’s great to know the ingredients that go into my morning breakfast are generally all natural and good for me. The below breakfast alternatives are rich in protein and fiber, packed with vitamins and very fresh. These ideas take anywhere from 3 – 15 minutes. What are some of your favorite breakfast options? I just returned from vacation in France, where I visited Loire Valley and Bretagne. Lots of sun-filled days were spent exploring 14th and 15th century castles, picnicking under trees, buying fresh veggies and fruits from markets and of course indulging in French cuisine. What I love most about French food is the pureness and simple complexity of it. Roasted ripe cherry tomatoes presented over a palette of greens. Simple ingredients that we can find in our garden, yet with an unexpected twist making it seem somewhat complex. Presentation is not a strength of mine, but after returning from France, it’s something I’d like to play around with, sometimes, just for fun. Here are a few pictures from my travel eats. The cotton candy was amazing! It was served with a fresh raspberry syrup and a droplet, as the syrup was poured over the candy, it zigzagged in and out of little air channels, quite mesmerizing to see. What are your favorite dishes from your summer holiday? I’m not sure what my recent obsession with chickpeas is about this month. 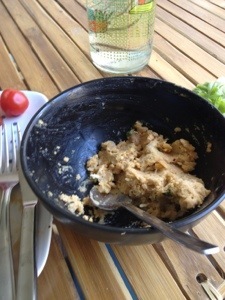 Last recipe share was a chickpea veggie burger recipe and this one is hummus. Must be this growing bump under my frilly apron. I always thought I’d take advantage of late night ice cream or brownie cravings during my pregnancy, but alas everything I eat seems to require chickpeas. 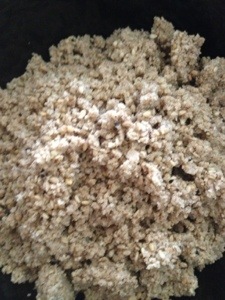 This month’s recipe came from the blog Frugal Feeding. A remarkable blog, where you can find just about everything delicious! I like that the blogger even tells you how much money cooking things at home cost you vs in the store. For most, in fact all recipes, just pennies in comparison to store brought. -Halved the quantity of ingredients (I was low on chickpeas). -Added fresh basil and parsley in lieu of cilantro. -Made a smoother paste, since I like mine on the smoother side. 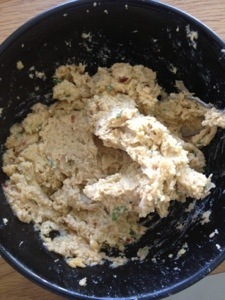 The tahini was homemade and I found the recipe on the blog Passion for Family. 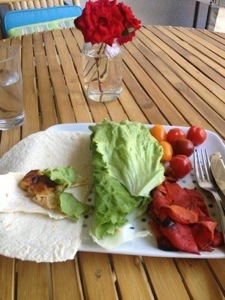 Also a wonderful blog with simple and easy recipes. Again I halved the serving size. Since I didn’t have the proper equipment I used my coffee grinder. Got the job done. Heading on summer holiday to France. I have a lovely container of hummus veggies and bread backed for the trip. I’ll try to remember to snap photos of all the delicious food! Happy cooking! This week’s recipe was taken from the blog, Take a Bite out of Life. I stumbled across this blog while searching for a recipe with chickpeas. I’m happy I did, because the blogger not only has some delicious cake recipes, but also has great recipes for those with dietary restrictions. Definitely worth checking her out. Her chickpea burger recipe has a wonderful spicy kick to it. It’s a delicious and healthy burger alternative that’s packed with protein. It’s also low in fat and cholesterol. Serve warm with lots of delicious herbed yogurt (plain yogurt mixed with your favorite herbs), your favorite salad or veggies mixture, pita bread and little squeeze of fresh lemon. Instead of baking, I pan grilled each burger on each side for 6-8 minutes . 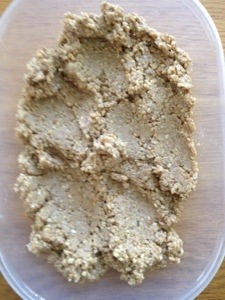 (The following day, I baked falafels with the leftover mixture and it was yummy, so both methods work well). My Favorite Pasta Salad Ever! Yesterday I had a small 4th of July dinner, per usual tradition. For dinner, I served rump steak cuts marinated in balsamic vinegar and molasses, summer squash sautéed with onions and pasta salad, followed by a dessert of red velvet cake, served with summer berries. Meat has slowly worked its way back into my life after a month without it. Back to the menu, I must say, the pasta salad was really the true star of the show. The meat and zucchini– only backup dancers. This salad is so refreshing and light. It’s chock full of delicious flavor and has a light citrus taste. This morning I actually contemplated eating it for breakfast with a slice of red velvet, but then realized that would leave me without lunch. This recipe is really simple to make, hope you enjoy it. And for those back home, hope you had a fun 4th! Boil pasta according to directions, strain, and run under cold water until cool. Place pasta, avocado, peppers, tomatoes, onions, carrots, in a bowl. Pour lemon juice on top and gently mix. Mix garlic and mayonnaise in a separate bowl. Add to salad and gently mix, evenly distributing sauce. Mix in fresh herbs and cheese, then season to taste. Place in the fridge for at least 30 minutes. Cook a Blogger’s Recipe Month? While scrolling through my reader, I instantly started drooling over and liking many recipes from food bloggers that I follow. There are so many wonderful recipes and food bloggers out there, it’s overwhelming at times! I often find myself simply saying “oh that looks so good, I have to try it”. However, as soon as a log-off, I go back to cooking my own dishes and simply liking others. I’m not sure if this is your experience too? In attempt to make a more interactive exchange with other food bloggers, I thought during the month of July I’d try another blogger’s recipe and blog about it. I’ll be sure to give credit to that blogger and link readers to the original recipe. If anyone else would like to take part, simple try a recipe you’ve been eyeing and post about it. Now on to the fun part, “screen” shopping for next week’s tasty recipe. Hope you’ll join me! If you do take part please tag your post “Recipe Share”. Happy Cooking! May was an unusually cold month. I’m so happy the weather has warmed up. The temperatures have been in the 90’s F/ 30’s C for the past week. Call me crazy, but I’ll take a sweltering heat over blustery frost any day. This week, in an attempt to cool off, the hubs and I headed down to the swimming pool and did a couple of laps and splashed around. Something about being in water always makes me insanely hungry, even if I just splash around in the pool. So when we arrived home, my husband whipped up a delish and quick meal of whole-wheat and quinoa pasta with sautéed mushrooms, lemon, onions and cream. It was so good and we were so starved that no pictures were taken. After dinner, we went outside to sit on the terrace. While outside, we started to smell the most delicious aroma of baked apple pie. This made me crave baked goods and I couldn’t shake the urge to bake. What else is any sane person supposed to do on one of the hottest days of summer, but crank up the oven? I quickly found a seasonal dessert recipe on Smitten Kitchen and off I went, stirring, mixing and pouring, to make this beauty (pictured below). So worth it! If you love strawberries as well as the crunchy and buttery taste of shortbread cookies, then this recipe’s for you. It’s essentially a large shortbread cook with strawberry jam. The original recipe calls for way more strawberries than I had on hand. I was still rather pleased with the results. Preheat oven to 350 F (180 C) and butter a 9 inch (spring-form) round baking dish. Cream butter and sugar, add in egg, vanilla and milk. Mix dry ingredients and add them into batter. 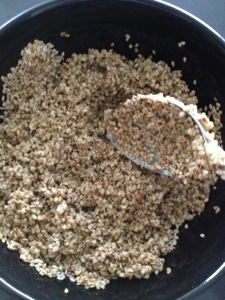 Pour mixture in prepared dish. Bake 10 minutes and then reduce heat to 325 (160 C), bake another 45 – 55 min. Allow to cool on a wire rack before serving. Serve with vanilla ice cream, whipped cream or au naturale. I think I’ll try this with blueberries and strawberries the second time around. Enjoy! This recipe is simple, healthy and protein-packed. It combines mildly sweet, savory, nutty and tangy flavors. It’s a nice meal to enjoy on a warm summer evening. Start off by cooking your quinoa, according to instructions. (For nice fluffy quinoa, cover the pot with a top and simmer on low). Season your salmon with thyme, salt and pepper. Place butter in a pan and melt, throw in rosemary sprigs, add salmon on top of rosemary and cook on medium-high until 1/2 way cooked and golden brown. Flip salmon and do the same for the opposite side.